Milk Glass Blue Floral Hanging Light or Table Lamp Font. 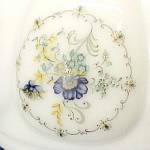 Opal white milk glass decorated with blue rings and Blue Flower sprays inside a ornate cameo circle. Colors are Light and Dark Blues, Aqua, Yellow Gold and Gray. Bulge Width: approx 7 inches diameter. Smaller Fitter without lip: 3 inches diameter to outer edges. I believe it needs a cap over it. Larger Fitter with lip: 4 inches diameter to outer edges. No chips or cracks. Nice paint and decals. I believe it could be used as the lower font in a hanging chandelier type fixture with the small end down, capped with a finial. 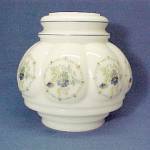 Or turned over, it could be the base of a table lamp.